Last week the Full Moon was completely immersed in Earth's dark umbral shadow, just briefly though. 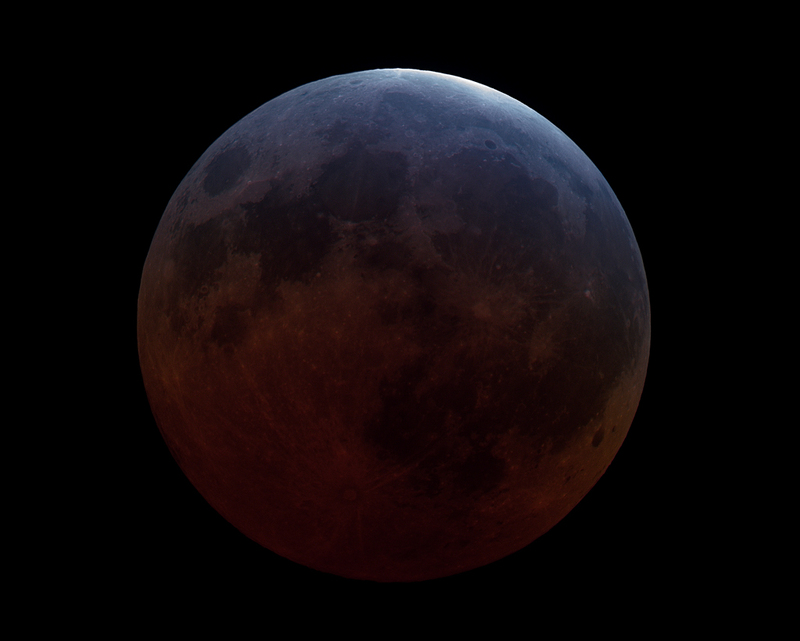 The total phase of the April 4, 2015 lunar eclipse lasted less than 5 minutes, the shortest total lunar eclipse of the century. In fact, sliding just within the Earth's umbral shadow's northern edge, the lunar north stayed relatively bright, while a beautiful range of blue and red hues emerged across the rest of the Moon's Earth-facing hemisphere. The reddened light within the shadow that reaches the lunar surface is filtered through the lower atmosphere. Seen from a lunar perspective it comes from all the sunsets and sunrises around the edges of the silhouetted Earth. Close to the shadow's edge, the bluer light is still filtered through Earth's atmosphere, but originates as rays of sunlight pass through layers high in the upper stratosphere. That light is colored by ozone that absorbs red light and transmits bluer hues. In this sharp telescopic view of totality from Auckland, New Zealand, planet Earth, the Moon's north pole has been rotated to the top of the frame. 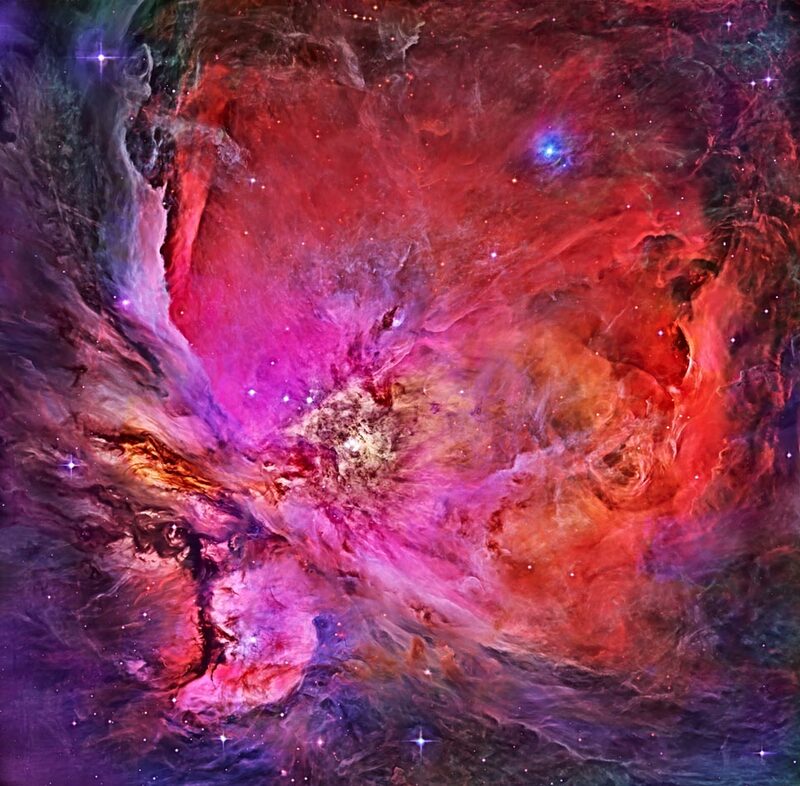 The Great Nebula in Orion, an immense, nearby starbirth region, is probably the most famous of all astronomical nebulas. Here, glowing gas surrounds hot young stars at the edge of an immense interstellar molecular cloud only 1500 light-years away. In the above deep image composite in assigned colors taken by the Hubble Space Telescope wisps and sheets of dust and gas are particularly evident. The Great Nebula in Orion can be found with the unaided eye near the easily identifiable belt of three stars in the popular constellation Orion. In addition to housing a bright open cluster of stars known as the Trapezium, the Orion Nebula contains many stellar nurseries. These nurseries contain much hydrogen gas, hot young stars, proplyds, and stellar jets spewing material at high speeds. Also known as M42, the Orion Nebula spans about 40 light years and is located in the same spiral arm of our Galaxy as the Sun. How far away is "redshift six"? Although humans are inherently familiar with distance and time, what is actually measured for astronomical objects is redshift, a color displacement that depends on exactly how energy density has evolved in our universe. Now since cosmological measurements in recent years have led to a concordance on what energy forms pervade our universe, it is now possible to make a simple table relating observed cosmological redshift, labeled "z", with standard concepts of distance and time, including the extrapolated time since the universe began. 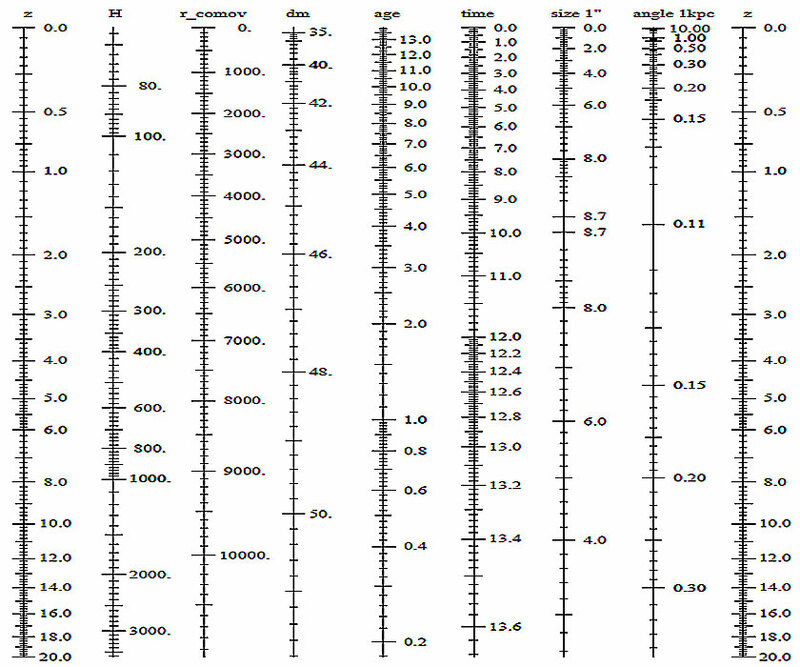 One such table is listed above, where redshift z is listed in the first and last columns, while the corresponding universe age in billions of years is listed in the central column. To find the meaning of the rest of the columns, please read the accompanying technical paper. Although stars in our galaxy are effectively at cosmological redshift zero, the most distant supernovae seen occur out past redshift one, which the above chart shows occurred when the universe was approximately half its present age. By contrast, the most distant gamma-ray bursts yet observed occur out past redshift six, occurring when the universe was younger than one billion years old, less than 10 percent of its present age. 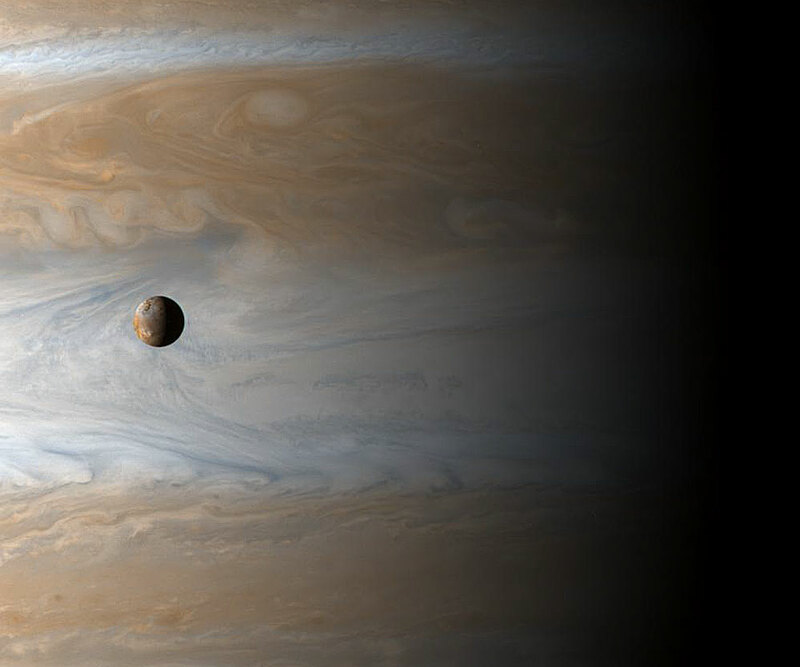 How big is Jupiter's moon Io? The most volcanic body in the Solar System, Io (usually pronounced "EYE-oh") is 3,600 kilometers in diameter, about the size of planet Earth's single large natural satellite. Gliding past Jupiter at the turn of the millennium, the Cassini spacecraft captured this awe inspiring view of active Io with the largest gas giant as a backdrop, offering a stunning demonstration of the ruling planet's relative size. Although in the above picture Io appears to be located just in front of the swirling Jovian clouds, Io hurtles around its orbit once every 42 hours at a distance of 420,000 kilometers or so from the center of Jupiter. That puts Io nearly 350,000 kilometers above Jupiter's cloud tops, roughly equivalent to the distance between Earth and Moon. The Cassini spacecraft itself was about 10 million kilometers from Jupiter when recording the image data. A journey to the center of a red giant star is very firmly in the realm of science fiction. But the science of asteroseismology can explore the conditions there. The technique is to time the small variations in a star's brightness measured by the planet hunting Kepler spacecraft. Regular variations indicate stellar oscillations, analogous to sound waves, that compress and decompress the gas causing brightness changes. As recently discovered in red giant stars, some of the oscillations detected have periods that would cause them to penetrate to the stellar core. In that extreme environment they actually become more intense and can return to the surface. 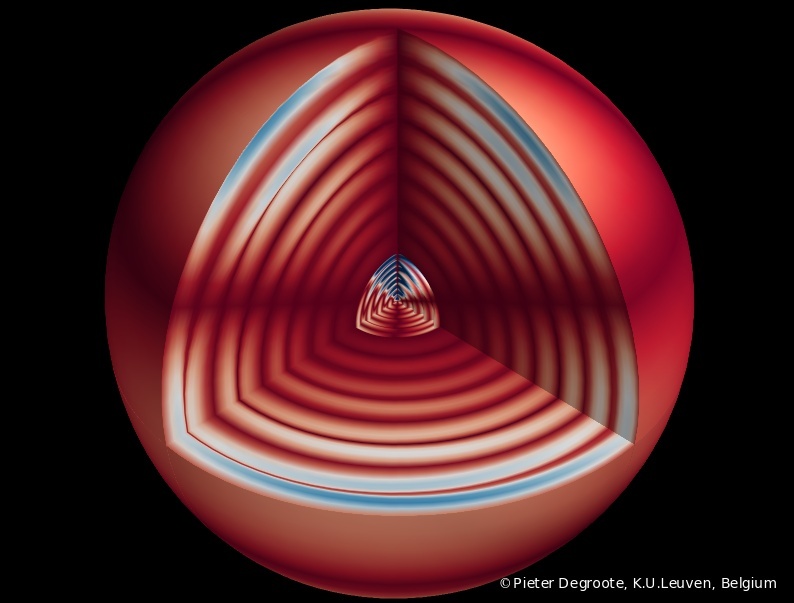 These echoes from the red giant's core are illustrated in this frame from a computer generated animation. Remarkably, the periods measured for the oscillations can even indicate how and where the red giant star's energy production, by hydrogen or helium fusion, is taking place. The space shuttle orbiter Discovery is now docked with the International Space Station, some 350 kilometers above planet Earth. Last Monday, its launch to orbit was a beautiful one as it rose into clear, predawn skies at 6:21am EDT from Kennedy Space Center's pad 39A. 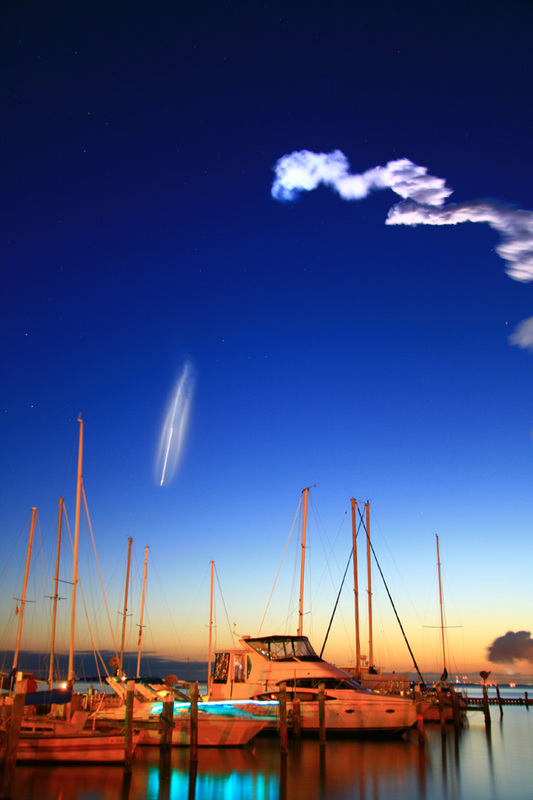 Looking east, this time exposure was taken shortly after lift off from a marina about 13 miles west of the launch site in Titusville, Florida. It shows the dawn's emerging colors along the horizon, with wafting rocket contrails at the upper right. The bright streak surrounded by the remarkable, elongated, vapor cloud near the center of the image is the actual track of Discovery, arcing toward the horizon and its orbital rendezvous. How was this unusual looking galaxy created? No one is sure, especially since spiral galaxy NGC 7049 looks so strange. 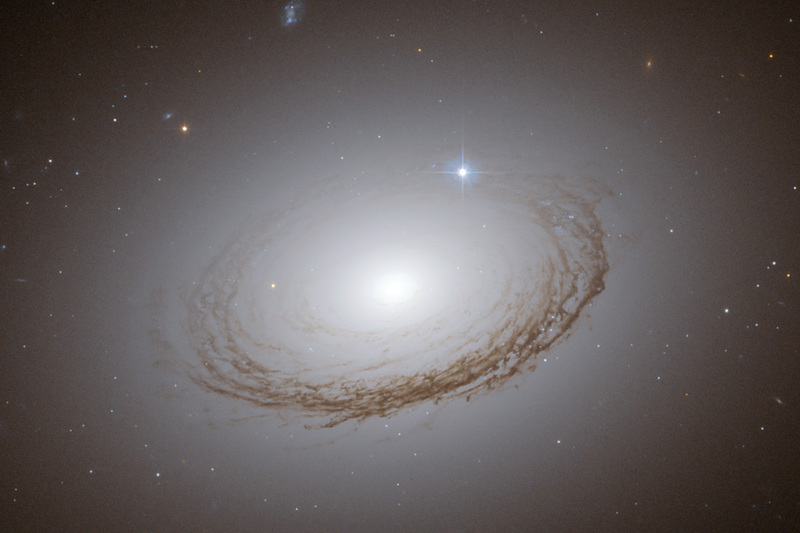 NGC 7049's striking appearance is primarily due to an unusually prominent dust ring seen mostly in silhouette. The opaque ring is much darker than the din of millions of bright stars glowing behind it. Besides the dark dust, NGC 7049 appears similar to a smooth elliptical galaxy, although featuring surprisingly few globular star clusters. NGC 7049 is pictured above as imaged recently by the Hubble Space Telescope. The bright star near the top of NGC 7049 is an unrelated foreground star in our own Galaxy. Not visible here is an unusual central polar ring of gas circling out of the plane near the galaxy's center. Since NGC 7049 is the brightest galaxy in its cluster of galaxies, its formation might be fostered by several prominent and recent galaxy collisions. NGC 7049 spans about 150 thousand light years and lies about 100 million light years away toward the constellation of Indus. 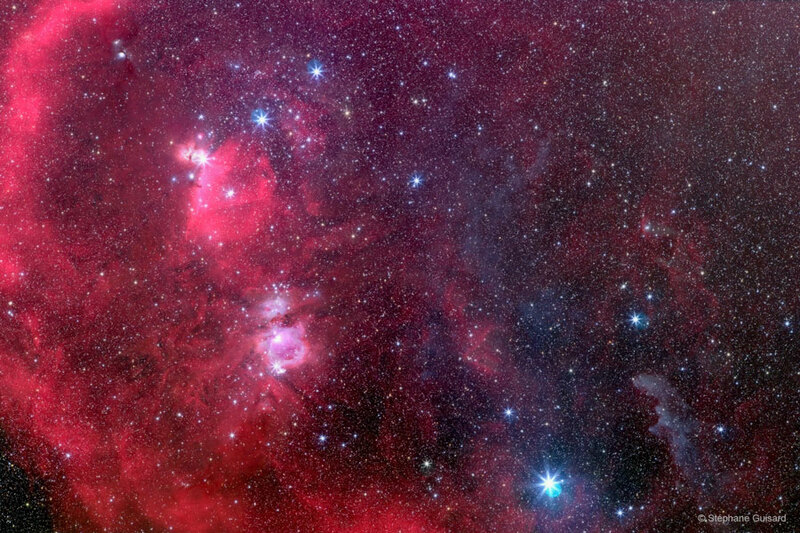 Do you recognize the belt of Orion in this image? The familiar trio of stars, visible to the unaided eye, can be found across the upper left. Otherwise, the southern part of the constellation Orion has taken on a new look in this unusually deep and wide view First note that the lower left belt star, Alnitak, is the easternmost star in Orion's belt. Left of Alnitak is the Flame Nebula, with clouds of bright emission and dramatic dark dust lanes. Directly below Alnitak, a close inspection will reveal the Horsehead Nebula. Farther right and below is the Orion Nebula, M42, itself visible to the unaided eye. The brightest star in the frame, near the bottom right, is Rigel. A bright blue star, Rigel illuminates the ominously shaped dust patch known as the Witch Head Nebula, visible as the blue reflection nebula near the lower right corner. Finally, appearing as a vast red ring and encompassing the entire region, is Barnard's Loop. Humans could see this entire menagerie, unaided, were their eyes about 10,000 times more sensitive. During the March 29 total solar eclipse, the Moon's dark central shadow or umbra is vanishing beyond the horizon in this dramatic view of the landscape a few kilometers southeast of Incesu, Anatolia, Turkey. The large, snow covered mountain in the distance is 3,250 meter high volcano Hasan Dag. 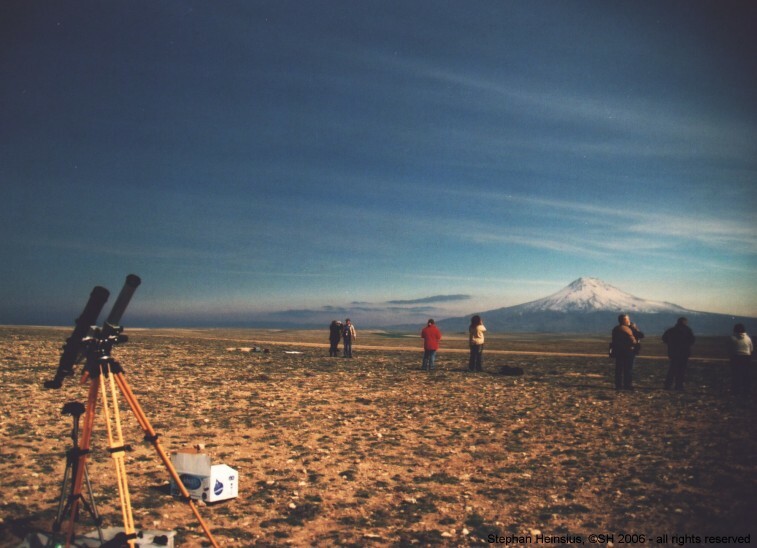 The foreground is growing brighter as eclipse watchers are just beginning to see rays of sunlight peek around the lunar limb, while the mountains on the horizon, left of Hasan Dag, are still completely shadowed by the Moon. For the watchers along this part of the shadow track, the total phase of the eclipse lasted less than 4 minutes as the umbra raced over them at more than 3,000 kilometers per hour. Dark dust lanes cutting across the middle of this gorgeous island universe strongly hint that NGC 3628 is a spiral galaxy seen sideways. About 35 million light-years away in the northern springtime constellation Leo, NGC 3628 also bears the distinction of being the only member of the well known Leo triplet of galaxies not in Charles Messier's famous catalog. Otherwise similar in size to our Milky Way galaxy, the disk of NGC 3628 is clearly seen to fan out near the galaxy's edge. A faint arm of material also extends up and to the left in this deep view of the region. The distorted shape and tidal tail suggest that NGC 3628 is interacting gravitationally with the other spiral galaxies in the Leo triplet, M66 and M65. 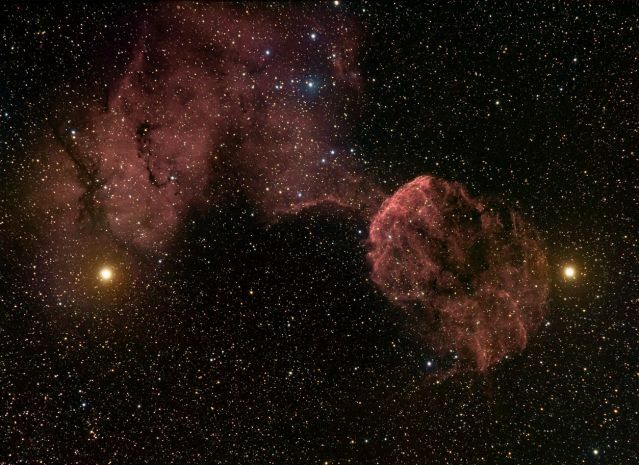 Normally faint and elusive, the Jellyfish Nebula is caught in the net of this spectacular wide-field telescopic view. Flanked by two yellow-tinted stars at the foot of a celestial twin - Mu and Eta Geminorum - the Jellyfish Nebula is the brighter arcing ridge of emission with dangling tentacles just right of center. Here, the cosmic jellyfish is seen to be part of bubble-shaped supernova remnant IC 443, the expanding debris cloud from an exploded star some 5,000 light-years away. Also in view, emission nebula IC 444 nearly fills the field to the upper left, dotted with small blue reflection nebulae. Like its cousin in astrophysical waters, the Crab Nebula, IC 443 is known to harbor a neutron star, the collapsed core of the massive star that exploded over 30,000 years ago. What do auroras look like from space? From the ground, auroras dance high above clouds, frequently causing spectacular displays. The International Space Station (ISS) orbits just at the same height as many auroras, though. Therefore, sometimes it flies over them, but also sometimes it flies right through. The auroral electron and proton streams are too thin to be a danger to the ISS, just as clouds pose little danger to airplanes. 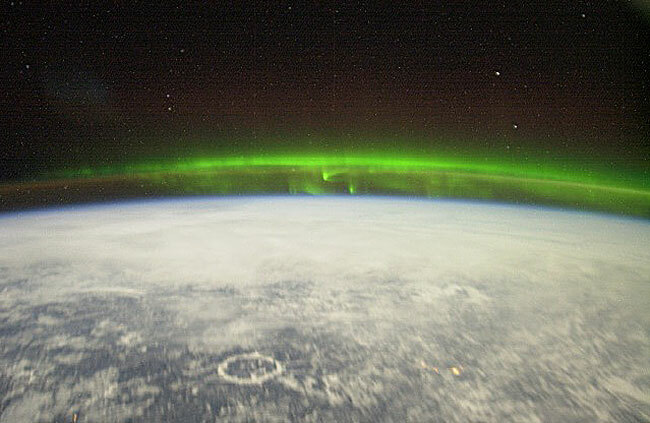 ISS Science Officer Don Pettit captured a green aurora, pictured above in a digitally sharpened image. From orbit, Dr. Pettit reports, changing auroras can appear to crawl around like giant green amoebas. Far below, on planet Earth, the Manicouagan Impact Crater can be seen in northern Canada. Lenticular galaxies aren't supposed to be photogenic. Like spiral galaxies, they contain a disk, but like elliptical galaxies, they are usually short on dust, gas, and pretty spiral arms. Lenticulars are relatively little studied, possibly because of their seemingly benign nature. Famous galaxies historically classified as lenticular include M84, M85, and M86. Recent pictures and evidence, however, indicate that lenticulars can be both photogenic and scientifically interesting. 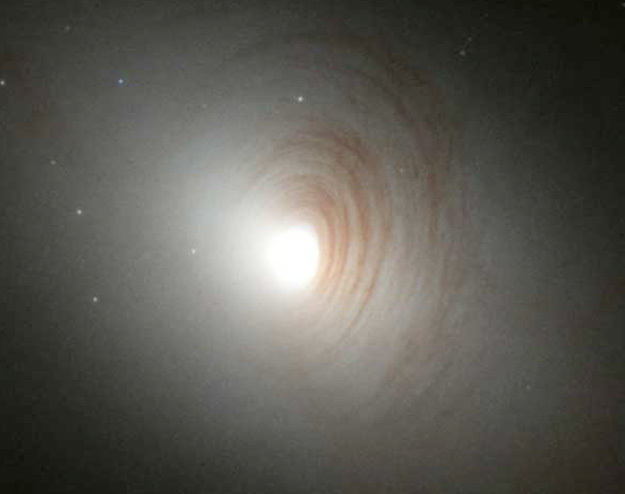 For example, the above image of NGC 2787 taken with the Hubble Space Telescope shows that the center of this lenticular galaxy has interesting structure. 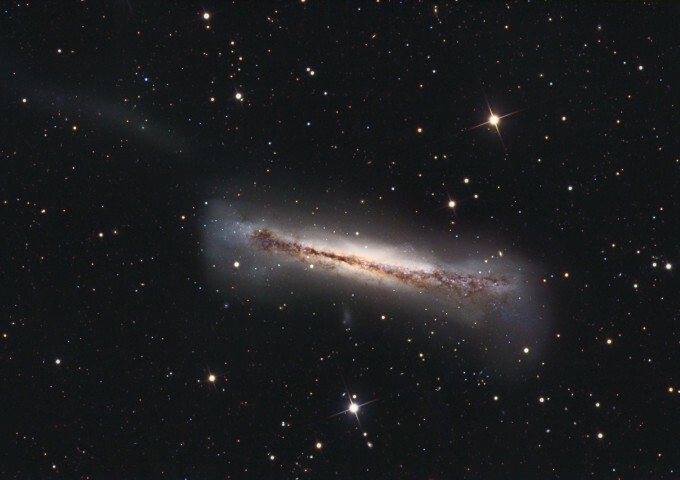 The image was taken to help determine how lenticular galaxies formed, and what happens in their centers. The span of NGC 2787 in the above image is about 4500 light years, while the galaxy lies about 25 million light years away toward the constellation of Ursa Major. 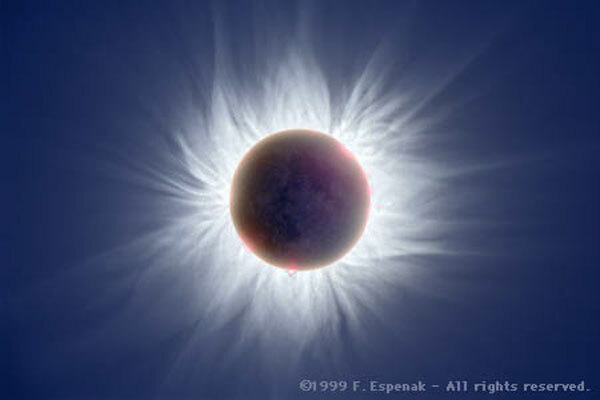 Most photographs don't adequately portray the magnificence of the Sun's corona. Seeing the corona first-hand during a total solar eclipse is best. The human eye can adapt to see features and extent that photographic film usually cannot. Welcome, however, to the digital age. The above picture is a combination of twenty-two photographs that were digitally processed to highlight faint features of a total eclipe that occurred in August of 1999. The outer pictures of the Sun's corona were digitally altered to enhance dim, outlying waves and filaments. The inner pictures of the usually dark Moon were enhanced to bring out its faint glow from doubly reflected sunlight. Shadow seekers need not fret, though, since as yet there is no way that digital image processing can mimic the fun involved in experiencing a total solar eclipse. The next total solar eclipse will be visible from parts of Africa on June 21. Nine years ago the massive Compton Gamma Ray Observatory was deployed in low earth orbit. 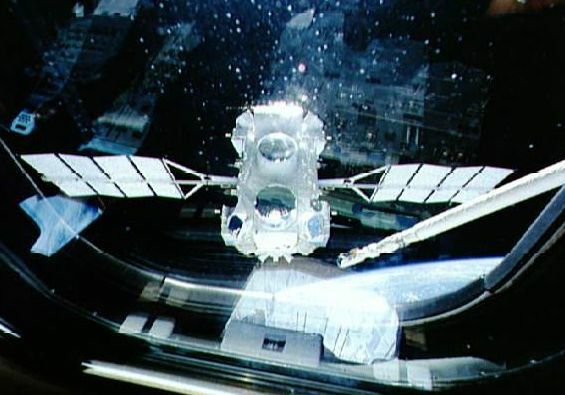 Sparkling interior reflections and the bright limb of the Earth are visible in this 1991 window view of Compton's release by the crew of the Space Shuttle Atlantis. Lofted above the protective atmosphere, Compton's instruments could explore the extreme high-energy Universe in gamma rays, photons with 100,000 times or more the energy of visible light. The premier gamma-ray observatory far exceeded expectations for a two- to five-year mission, but a recent gyroscope failure has prompted NASA to decide to steer the satellite safely back into the atmosphere. Compton's lasting legacy of discovery will include the detection of more than 400 celestial gamma-ray sources, 10 times more than were previously known; and more than 2,500 gamma-ray bursts. On April 20, 1967, NASA's robot spacecraft Surveyor 3 landed on the moon, touching down on the inside slope of a small lunar crater in the Ocean of Storms. Over 2 1/2 years later, on November 19, 1969, the lunar module Intrepid, piloted by Apollo 12 astronauts Pete Conrad and Alan Bean, flew overhead and landed nearby in the second visit by humans to the lunar surface. Intrepid touched down about 600 feet away and the moon walking astronauts were easily able to reach the Surveyor and examine the remote explorer that had preceded them. Intrepid is seen in the background of this striking high resolution picture of Surveyor 3. Surveyor's leftmost foot pad appears dug in while its foreground foot pad has made two distinct imprints in the powdery lunar soil - clear indications that the Surveyor slid and bounced on landing. 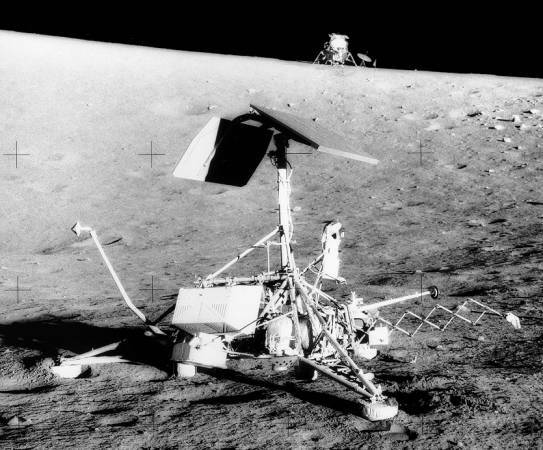 Using bolt cutters, the astronauts removed Surveyor's TV camera (the cylinder shape at the right of the tall solar panel mast) and its sampling scoop (on the arm extended to the right), returning them to Earth for study. Credit: J. M. Malville (U. Colorado) & F. Wendorf (SMU) et al. 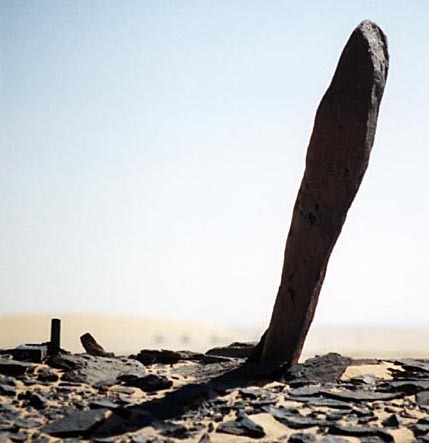 In the Sahara Desert in Egypt lie the oldest known astronomically aligned stones in the world: Nabta. Over one thousand years before the creation of Stonehenge, local herders built a stone circle and other structures on the shoreline of a lake that has long since dried up. Over 6000 years ago, stone slabs three meters high were dragged over a kilometer to create the site. Shown above is one of the stones that remains. Little is known about the ultimate purpose of Nabta and the nature of the people who built it. What's that point of light above the World Trade Center? It's Comet Hale-Bopp! Both faster than a speeding bullet and able to "leap" tall buildings in its single orbit, Comet Hale-Bopp is also bright enough to be seen even over the glowing lights of one of the world's premier cities. 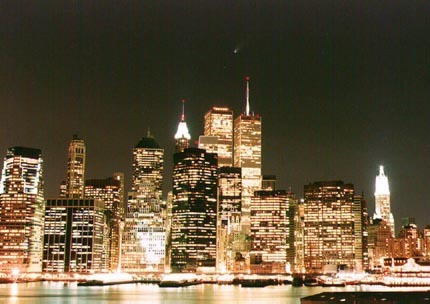 In the foreground lies the East River, while much of New York City's Lower Manhattan can be seen between the river and the comet. Comet Hale-Bopp is now moving away from both the Sun and the Earth. It should, however, should remain visible even in northern cities for at least a month. To find Comet Hale-Bopp, look for the brightest object in the northwest sky just after sunset - or wait for its return in 2400 years. Oberon is the most distant and second largest moon of Uranus. Discovered by William Herschel in 1787, the properties of the world remained relatively unknown until the robot spacecraft Voyager 2 passed it during its flyby of Uranus in January 1986. Compared to Uranus' moons Ariel, Titania, and Miranda, Oberon is heavily cratered, and in this way resembles Umbriel. Like all of Uranus' large moons, Oberon is composed of roughly half ice and half rock. Note that Oberon has at least one large mountain, visible on the limb at the lower left, that rises 6 km off the surface.